Beginners Guide to Paint Military and Fantasy miniatures. How to Paint Miniature Figures Guide. A New Dawn for Miniature Painting. It can be stated that among the most challenging of all in miniature modelling is painting miniature figures. Many new miniature modellers shy away from miniature figures since it requires a certain amount of painting and modelling skill level. A lot of things have changed over the years in the world of miniature modelling. For those of us who have just come back to the scale modelling and painting after many years suddenly realized how much more this hobby has to offer. the secrets of painting miniature figures have been unearthed and can be easily learned through the comfort of one's home. Never call it a Toy! Traditionally, miniature figures started as pre-painted toy soldiers made from lead. (If you watched the movie �The Patriot� about the American revolution of 1775-1783, you will notice a scene where lead toy soldiers were melted down to become rounds for a musket.) Forward that by 200 plus years and today you have a new evolution of miniature figures made of plastic, resin as well as non-lead based metals. Brands names like Games Workshop, Dragon Models and many others have had emerged to replace or challenge established company names and make the miniature modelling market very competitive. It is therefore proven that miniature modelling is still alive and well. All it needs is a little encouragement and that is what this miniature painting website is all about. What is painting a miniature figure if we can't paint a face. 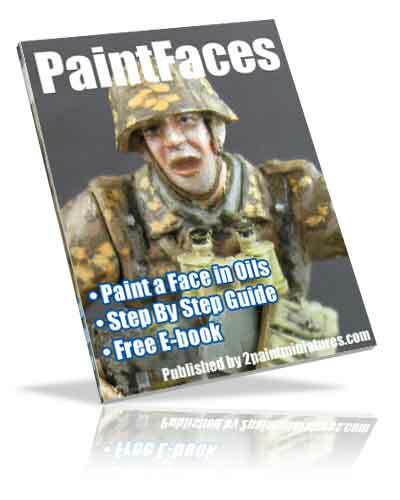 Download this Ebook on how to paint a face in oils. Learn the step by step process of painting a miniature face. Lighting tips to consider before painting your miniature. 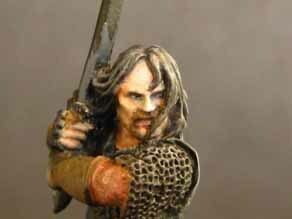 What types of miniature paint to use plus learn tips on painting eyes. The biggest myth surrounding miniature painting and modelling is that some people are born with the talent to paint better than others. Well the truth is that those who can model and paint miniatures figures very well have consistently dedicated long periods of their time experimenting and practicing their craft. The key to getting better is repetition - the more you do it the better and more comfortable you are with it. 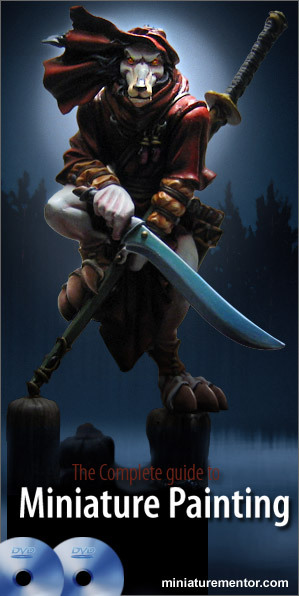 With the above analysis in mind, all the novice miniature modeller needs is the right tips and techniques to succeed in painting better miniature figures in a shorter time period. So the professional miniature modellers and painters have paved the way for all of us, it is up to us to gather all the info and fly with it! There are many miniature painting and miniature modelling books like from Osprey Publishing, Games Workshop, Andreas Miniatures and many others that publish books that cover many aspects of this hobby. Prefer to use Acylics for Painting Miniatures? If you are new to miniature painting, the big question is: Should I get acrylics, oils or enamels? First you need to know how each medium work and select the one you are most familiar or comfortable with. Among all mediums, acrylics is the newest medium to emerge in miniature painting.More and more manufacturers are recommending acrylics however, traditional mediums like oils are still widely in use. Of course the other challenge is to select which sort of paints; Citadel Miniatures Paint, Vallejo Model Color, Andreas Minatures Paint , Tamiya Paints are only some among many. All miniature paints systems have its strengths and weaknesses and should be utilised based on that criteria.